Archaeology of textile production in the kingdom of Meroe. New approaches to cultural identity and economics in ancient Sudan and Nubia. The TexMeroe project aims to gain a better knowledge of the Sudanese ancient kingdom of Meroe (c. 300 BCE – 550 CE), exploring its social organisation and economic system through the study of textile production. The many well-preserved textiles, tools and costume representations discovered on archaeological sites throughout Sudan and Nubia provide new evidences that shed light on this little- known side of Meroitic history. Their analysis will open new avenues of research encompassing a great range of key issues, from agriculture and manufacturing techniques, to the organisation of labour and trade, and the definition and communication of social status. The research follows the entire life cycle of the textiles, from raw material collection, to the spinning, dyeing, weaving and sewing of the cloth, all the way through the multiple every day uses and reuses of the fabrics to their final internment. The chosen methodology is first and foremost archaeological, but the project also combines the methods of other fields, such as comparative history, art history, ancient textile studies, material studies, anthropological theory, and archaeobotany. 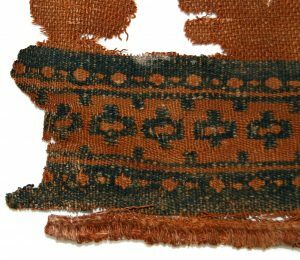 Both in techniques and aesthetics, the Meroitic kingdom developed a unique textile tradition which represents a remarkable synthesis between the traits of both local Sub-Saharan cultures and resources of the Pharaonic and Hellenistic worlds. Often over-shadowed by the famous Late Antique Egyptian tapestries, the specificities of the Meroitic textile production are not well recognized or understood. I will study in detail three different technics characteristic to ancient Sudan – the openwork decorative borders, the pile weave, and the colourful dyes – in order to define the relationship that existed between crafts and cultural identity. Typical of the Sahelian regions of the Sahara, the Meroitic economy stands on the shifting patterns of production between sedentary populations and pastoral tribes, the seasonal exploitation of the desert hinterlands, and the political centralisation and redistribution of goods. In this theoretical framework, textile activities occupied a crucial position. The study of textile production provides a highly welcome method to test the current economical hypothesis with quantifiable material data. I will focus on the development of cotton production and use, on the integration of spinning and weaving within settlements industrial activities, and finally on the relationship uniting textiles to their consumers. Produce a detailed analysis of manufacturing technics specific to the Meroitic populations. Understand the organisation of textile production and its industrial model(s).